Welcome to our newsroom! Here you will find the latest information about our company, projects and people. Browse articles published by our engineers and scientists in national publications and conference proceedings, view our press releases and read through news coverage of Terracon. If you are a member of the media, you may contact our media relations representative at media@terracon.com. BLACKSBURG, Va. — The Terracon Foundation announced a $10,000 University Grant to the Virginia Tech Foundation. The grant will be used to continue the Terracon Graduate Fellowships program initiated in 2012 and an annual seminar series. Fellowships for the 2019-2020 academic year will be awarded to graduate students in the Civil and Environmental Engineering (CEE) Department, focusing on geotechnical, structural, and environmental engineering students. Students will be selected based on their academic capability with a strong consideration of their interest to continue careers in the consulting industry. The fellowships are intended to allow Virginia Tech students to benefit from early hands-on experience in the industry. Aaron Muck, P.E., geotechnical services assistant director in Terracon’s Cincinnati office, championed the grant application. Current student and fellowship recipient Hunter Ingram, who was awarded a grant to start graduate school in the fall 2018 semester, said “It’s great to know that Terracon values higher education enough to invest in the next generation of the workforce.” Another 2018 grant recipient, Manish Dulal, said the fellowship allowed him to devote more time to researching geotechnical engineering. For more information about the Virginia Tech Department of Civil and Environmental Engineering, visit https://www.cee.vt.edu/. For more information about the Terracon Foundation and other organizations it has supported, visit terracon.com/foundation. OLATHE, Kan. ­­– The Terracon Foundation is pleased to announce the award of $98,300 in community and university grants and scholarships. The Terracon Foundation was established as the community investment arm of Terracon with a goal to reach out and become a real part of the lives of company employees and the communities where they live and work. “The recent grants awarded by the Terracon Foundation support a variety of local needs from a diverse group of nonprofit organizations where our employees are actively involved. These range from helping to educate students in STEM careers to providing state-of-the-art equipment to engineering departments at universities,” said Matt Wheaton, chair of the Terracon Foundation and manager of the environmental department in Terracon’s Seattle office. High Point University, High Point, N.C.
University of Arkansas, Fayetteville, Ark. University of Illinois, Urbana-Champaign, Urbana-Champaign, Ill.
Virginia Tech Foundation, Blacksburg, Va. The Terracon Foundation awarded $45,800 in community grants to 15 local, nonprofit organizations that were recommended by Terracon employees involved with these organizations. Community Culinary School of Charlotte, Charlotte, N.C.
Literacy Kansas City, Kansas City, Mo. Phoenix Family Housing Corp, Kansas City, Mo. Piper Unified School District 203, Kansas City, Kan.
Rotary Club Of Tulsa Foundation, Tulsa, Okla.
SARSEF – Southern Arizona Research, Science And Engineering Foundation, Tucson, Ariz.
Wayside Waifs, Kansas City, Mo. For more information about the Terracon Foundation, visit terracon.com/about/foundation. Terracon is an employee-owned engineering consulting firm with more than 4,500 employees providing environmental, facilities, geotechnical, and materials services from more than 150 offices with services in all 50 states. Terracon currently ranks 24th on Engineering News-Record’s list of Top 500 Design Firms. HOUSTON — Terracon, a leading provider of environmental, facilities, geotechnical, and materials services, is pleased to announce Harold Cobb, P.E., has been named the 2019 Houston Area “Engineer of the Year” by the Houston Engineers Week Committee, and will be honored during the nationwide celebration of Engineers Week on Feb. 22, 2019. The City of Houston and Harris County, Texas have declared Feb. 22, 2019, as “Harold Cobb, P.E., Day.” Cobb, who is executive vice president and central operating group manager in Terracon’s Houston office, is responsible for leading 46 offices in 11 states, with gross revenues of $245 million annually. Cobb’s career in consulting engineering has spanned more than 35 years. He joined Terracon in 1998. Cobb has held leadership roles in numerous professional and technical associations, including the American Society of Civil Engineers, the Texas Society of Professional Engineers, National Society of Professional Engineers (NSPE), the Society of American Military Engineers (SAME), the American Council of Engineering Companies, and the Society for Marketing Professional Services. In 1994, Harold was recognized by the Northwest Houston Chapter as the Young Engineer of the Year. In 2010, he was recognized as a Distinguished Engineer of the Texas Engineering Foundation. In 2010, he was named SAME Fellow and in 2014 was named as NSPE Fellow. He currently serves on the Texas A&M Civil Engineering Advisory Council and is Chair of the Texas Engineering Foundation Board of Trustees. He has a civil engineering degree from Texas A&M University and an MBA from LeTourneau University. He became a licensed professional engineer in 1989 and maintains licenses in Texas and Florida. Terracon is an employee-owned engineering consulting firm with more than 4,500 employees providing environmental, facilities, geotechnical, and materials services from more than 150 offices with services available in all 50 states. Terracon currently ranks 24th on Engineering News-Record’s list of Top 500 Design Firms. OMAHA, Neb. 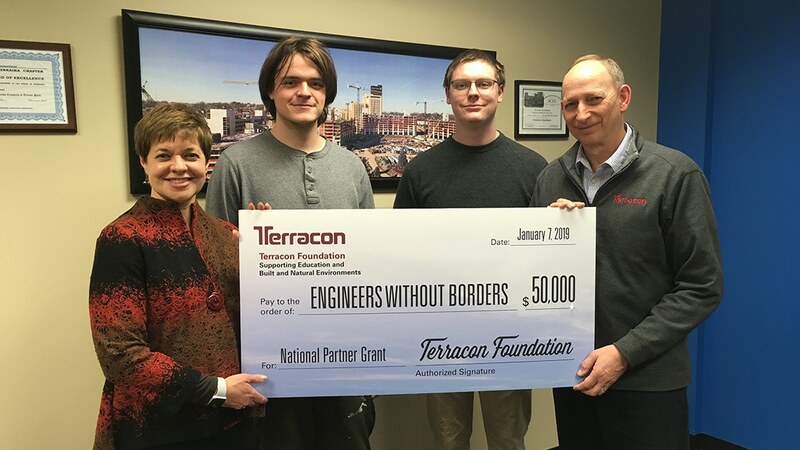 — The Terracon Foundation is pleased to announce the presentation of a $50,000 National Partner grant to Engineers Without Borders USA (EWB-USA). To date, the Foundation has granted nearly $2 million to community organizations, universities, dependents of employees, and for disaster relief efforts. The Terracon Foundation encourages employees to submit grant requests for organizations focused on education and the built and natural environment. Ed Prost, P.E., geotechnical services department manager in Terracon’s Omaha office, championed the grant application. The grant funds will be used to support EWB-USA’s mission to build a better world through engineering projects empowering communities to meet their basic human needs and equipping leaders to solve the world’s most pressing challenges. EWB-USA programs focus on university education at 174 colleges and universities nationwide, workforce training and professional development, and infrastructure projects in hundreds of communities around the world. Prost recently presented the check to Jody Debs, EWB-USA board president, and engineering students Andrew Butler and Ethan Triplett of the EWB-USA University of Nebraska-Lincoln Chapter. The Terracon Foundation was established with a goal to reach out and become a real part of the lives of Terracon employees and the communities where they live and work. For more information about the Foundation and other organizations that have received Foundation grants, please visit www.terracon.com/about/foundation. Terracon is an employee-owned engineering consulting firm with more than 4,500 employees providing environmental, facilities, geotechnical, and materials services from more than 150 offices with services in all 50 states. Terracon currently ranks 24th on Engineering News-Record’s list of Top 500 Design Firms. For additional information about Terracon, visit www.terracon.com. Engineers Without Borders USA (EWB-USA) is a nonprofit organization that builds a better world through engineering projects that empower communities to meet their basic human needs and equip leaders to solve the world’s most pressing challenges. EWB-USA’s thousands of highly skilled volunteers work on more than 700 projects in partnership with local communities, non-governmental organizations, governments and United Nations agencies in 44 countries to design and implement sustainable and technologically appropriate infrastructure solutions. For more information, visit www.ewb-usa.org. 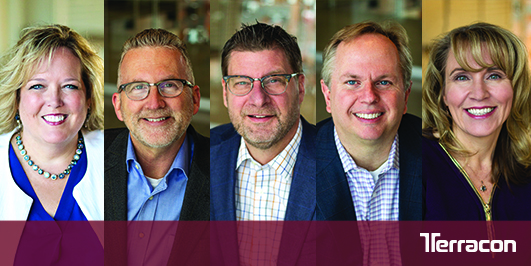 OLATHE, Kan. — Terracon, a nationally known and respected consulting engineering firm, announces several strategic organizational changes designed to guide the company as it continues to grow. M. Gayle Packer is now chief executive officer (CEO) and president of Terracon Consultants, Inc. This completes a deliberate, multiyear succession process, following her appointment as president in June 2018. Prior to being named president, Packer served as executive vice president and chief administrative officer (CAO). As CAO, Packer coordinated the acquisition and integration of more than 50 companies, 100 offices and 2,000 employees. 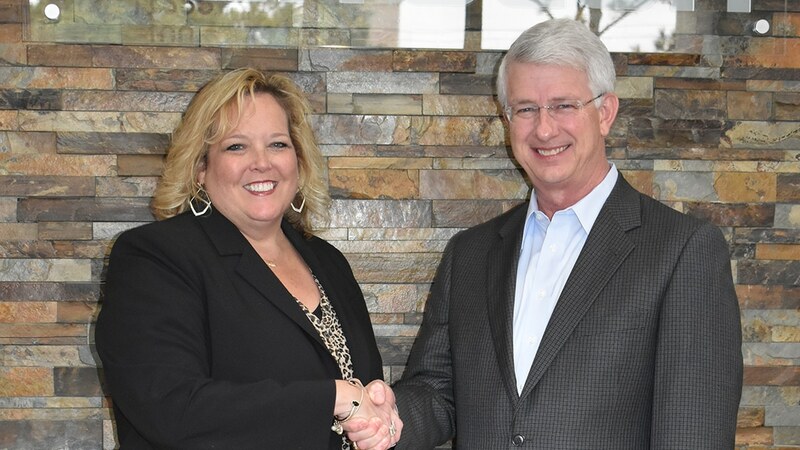 She succeeds David Gaboury, P.E., who served in leadership roles at Terracon for more than 16 years, most recently as CEO. Gaboury continues as Terracon’s chairman through 2021. Michael O’Grady, P.E., is now chief development and safety officer, responsible for the development, growth, and quality of all service lines and business sectors and related strategic initiatives. During the past 18 years, O’Grady has been instrumental in developing Terracon’s Materials Service Line practice and for the past six years, also leading the development of its safety culture. He will continue to chair Terracon’s Incident and Injury-Free (IIF) safety efforts in this expanded role. O’Grady formerly served as executive vice president of Materials and Safety. John Prutsman is now chief people officer, focusing on the employee experience of Terracon’s more than 4,500 employee-owners. Since joining the firm four years ago, Prutsman has served as senior vice president of Human Resources and Employee Development and Wellbeing. He will continue to chair Terracon’s Employee Engagement Leadership Team to innovate key people initiatives such as Connection and Career Conversations. He also joins Terracon’s Executive Committee. Mike Yost is now chief legal officer, tasked with helping to guide the company through complex risks and legal issues. He will also provide additional support to Terracon’s operating group managers, and the mergers and acquisition process. Yost served as general counsel for more than 10 years, assisting the company with legal and risk management issues. Kristi Tahmasiyan is now director of mergers and acquisitions (M&A), guiding the strategic development and execution of the M&A program. Over the past 10 years, she has helped integrate more than 40 companies into the firm and is a frequent industry presenter.